Saevitia was the first picture i finished in my ‘hades‘ project. I wanted a really dangerous looking atmosphere on that planet and did go for warning red colors there. Right from the beginning i knew this is a concept project. No full blown, detailed, monster painting like i did with EPICA for example. 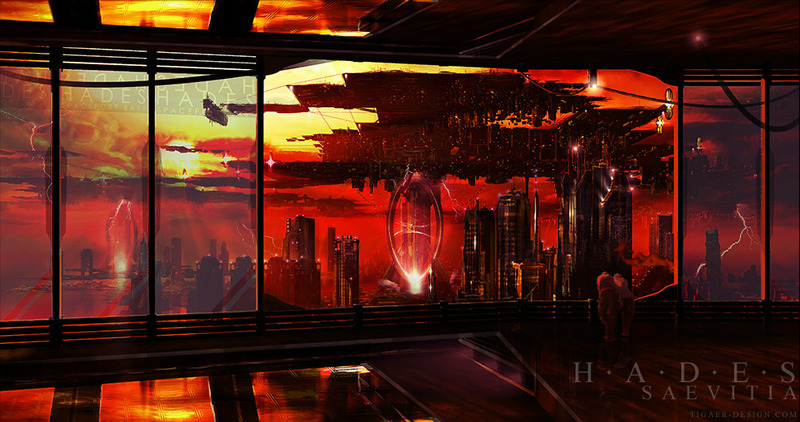 Another thing i knew right from the beginning was that i wanted to bring in these hovering flat structures in the sky. Basically these things are cities… but upside down. Antigrav generators keep the whole structure in the air. I cannot really tell why this planet got colonized in the first place… maybe it was an industrial cause. That would explain the dirty, technology look. So yes, as you can see… a lot of experimental stuff. Basic 3d plate created with VUE and heavily refined with photoshop. This entry was posted on Sunday, May 25th, 2008 at 00:25	and is filed under Paintings. You can follow any responses to this entry through the RSS 2.0 feed. You can leave a response, or trackback from your own site.